Im planning on picking this squash within the next few days and I just wanted to make sure it looked ripe. What do you think? looks like the right color to pick!. When ripe winter squash change color a bit and the skin gets real tough. If I want one to eat, I don't wait for the vine to die. I pick it when it looks ready. When it freezes, all the vines die and it is time to pick up the squash. If you are storing squash, try to leave two inches or so of stem on them. They keep much better. We just had a Delicata squash for dinner. It is a winter variety. Yummy. 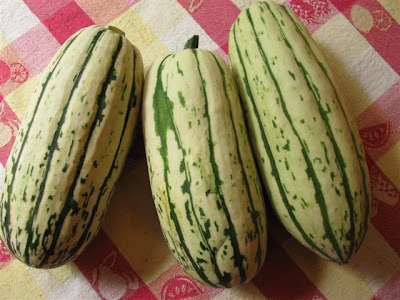 Spegetti squash also has several squash on each plant and I pick the earliest ones that are solid with tuffer skin! I think the plant grows better when the older squash are picked but I prefer to cut it off not twist it! Delicata is my absolute favorite squash! Beautiful to look at and yummy to eat. It volunteered one year from seeds of the CSA farm delicata we ate. I saved seeds from that and grew it one more year, but then I didn't manage to keep saving the seed and it is sometimes hard to find. But seems to be one of those that the vine borers don't eat, so I will have to look harder next year. How do you guys prepare/eat squash? I am not a big squash eater so never grow it. 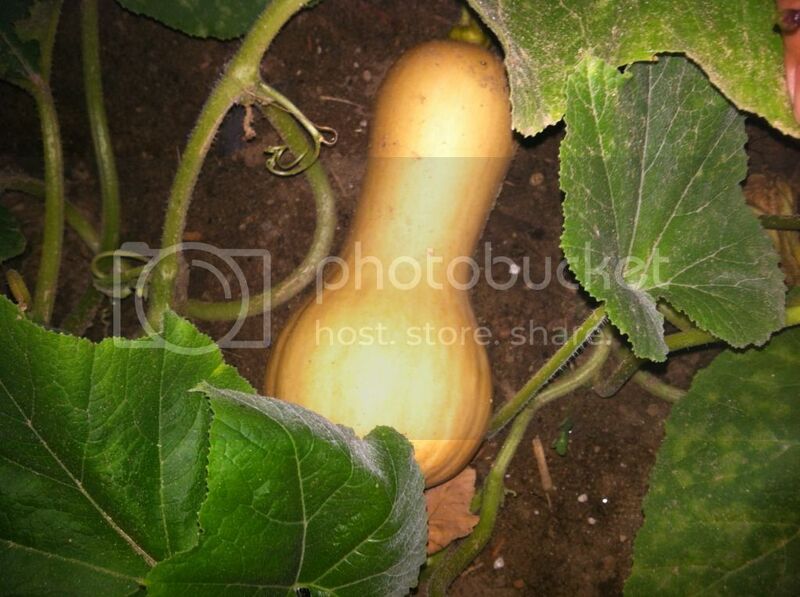 I am growing a single spaghetti squash plant now though. You can peel, dice into 1.5 inch pieces ,and steam it till tender. Serve with butter and salt and pepper. You can take a delicata and cut in half lengthwise scoop out the seeds, and put it on a plate cut side down and nuke it for 5 minutes. Yummy. The large winter squash like Hubbard or Banana You cut open take out the seeds, cut into several chunks and go visit the neighbors. The piece you keep for yourself, can be prepared as above, or baked in the oven until tender. I think the oven baked squash is the best of all. This is my first year growing Delicata. We have had a couple of them and they are yummy. I don't think I will save seed though as we have other varieties in the same species and surely with all my bees we would have hybrids. Who knows the hybrids may be good too, but you never know what you will get. Last year I grew Hubbard and Yellow Banana squash. These are both in the same species. I did save some seed and planted it this year. Too early to say what it made, but I do have some squash set on. I don't save pumpkin seed either. It will cross with all the summer squash. One year I did save some seed and planted it. The fruit I got was the basic shape of a pumpkin, but it was all lumpy kinda like a crookneck, but larger lumps. I am told that if you want to save squash seed, and keep the strain pure, you only grow one variety and grow it where there are no other squash within a mile. The mile, because bees will fly a mile easily and are species specific. IOW if they are working squash that is all they will work on that trip into the field. IOW if they are working squash that is all they will work on that trip into the field. First day, they were all over the cherry tree and blueberry bushes, next day, there were less on the cherry tree and almost none on the blueberries, but tons on hazel bush nearby, the next day, there were hardy any on the cherries, blueberries or hazel, but they were all over the rhubarb and okra... And so on all around the garden. Was thinking -- do they all get up in the morning and say: "So, what's the menu? Blueberries today?" "Nah, the blueberries was yesterday -- how about strawberries today?" "No, no! I vote rhubarb!" "Well, WE are heading out for okra." Point is, I kept on having to look where I was not expecting them. And it's not like the other plants were infested on those other days either. Now I want to try that delicata squash!!! I did pick my squash and had it for dinner tonight. It was excellent. How do you guys prepare/eat squash? My wife prepared it, but I know she pealed it and then cut it into chunks. she then boiled them. Once they were boiled she mashed them like potatoes. Im not exactly sure what she used for seasoning but it tasted like cinnamon and butter, maybe a little milk. 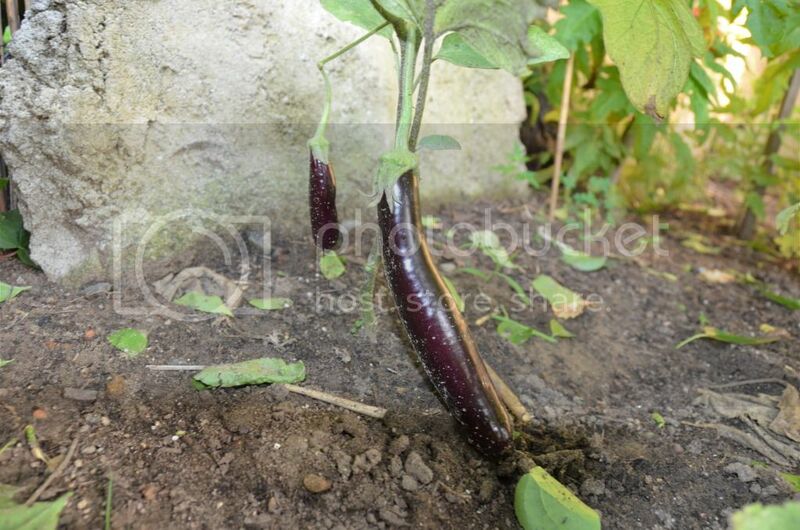 On a side note, I also had this finger eggplant tonight. Also excellent! Last edited by bell7283 on Wed Aug 08, 2012 6:46 pm, edited 2 times in total. sheeshshe wrote: Now I want to try that delicata squash!!! How big do these plants get? My Delicata is bush type. I planted 4 seeds to a hill. The vines get about 3-4 feet long, they go off in different directions, so the total group takes up a space 7 to 8 feet in circumference and the leaves are at least 3 feet off the ground in the center of the hill.